You guys…I just bought myself my FIRST big girl bag! Up until now, I couldn’t justify spending several hundred dollars. Some of my old purses have come from Target, New York & Company, or DSW. I like bags with compartments and pockets. My new bag, from Michael Kors, has the perfect amount of space and pockets. I always look for a pocket on the exterior to put my keys, a zipped pocket on the inside for feminine products, and an open pocket on the inside for gum/chapstick/lotion/etc. I hate digging around for things, so having them easily accessible is key! Plus, I got it on sale at Nordstrom Rack for less than $200. YAY! ::Side note:: I purchased a leather cleaner, protector and conditioner from Bickmore Bick (here on Amazon). I was easy to use and no bad smells! 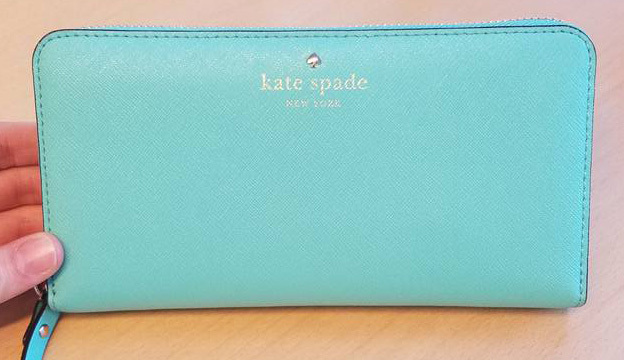 Next up, my Kate Spade wallet. My older brother gave it to me Christmas last year. I love love love my wallet! The bright color and SUPER cute polka dots are to die for! 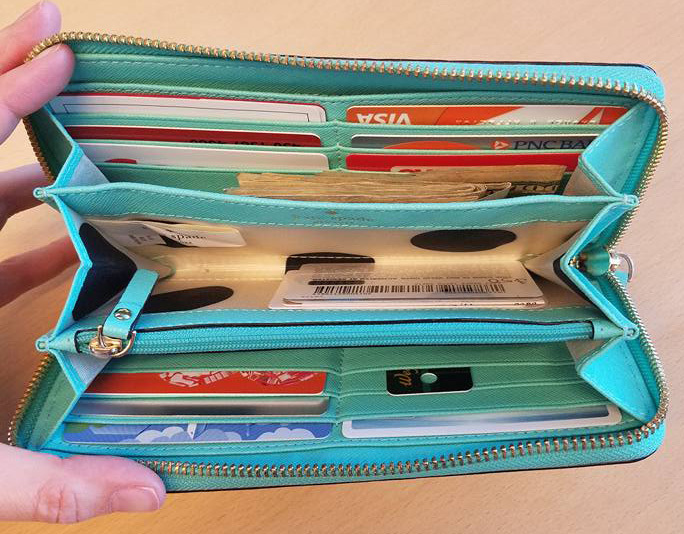 It holds my debit and credit cards, rewards cards, driver’s license and insurance cards. Plus, there’s partitions for cash and gift cards or coupons. Next, I have a pair of Knockaround sunglasses. A friend from college introduced me to the brand — good quality and inexpensive. I love the Premiums! I’ve had several pairs and, to be honest, I’ve lost a few — but they’re so cheap that you can just order another. Knockaround offers a feature where you can customize the the color of the frame, arms, and lenses. My current pair are the Glossy Black Tortoise Shell. And my super cute sunglasses case is from Target. I carry Eucerin Intensive Repair Hand Creme all the time. My hands are always dry and need a thick layer of lotion without feeling greasy. I’ve tried numerous other hand lotions and I always go back to Eucerin. I keep tweezers in my bag. Whether it’s a stray hair, a hangnail, or a splinter, tweezers are a must! I can’t tell you how many times I’ve used my tweezers out and about! As for the items that I don’t use often, but keep “just in case”…a nail file, compact mirror, gum, lip balm, hair tie and bobby pins. 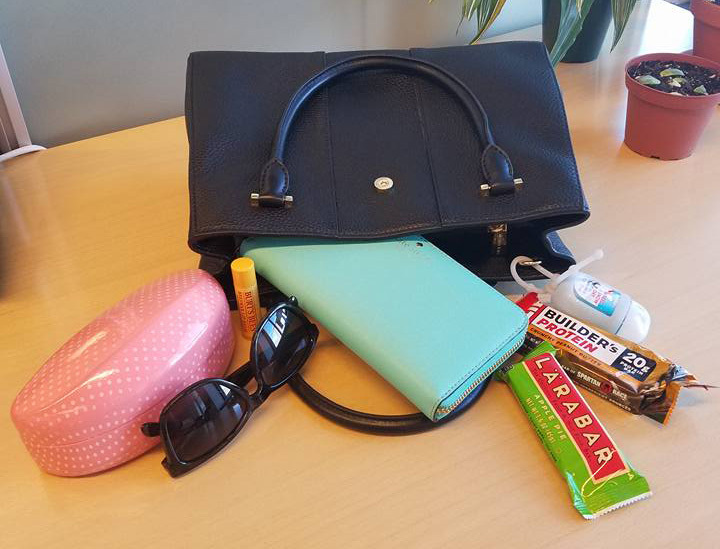 What do you carry around in your purse?